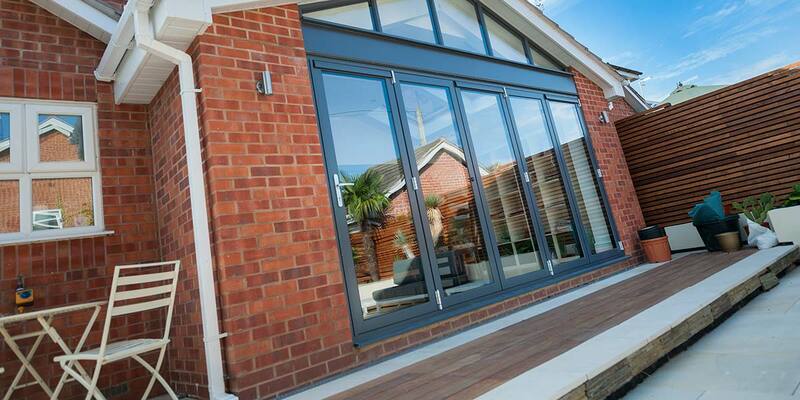 Our stunning range of aluminium bi-fold doors are a stylish addition to any home, creating the illusion of added space & light, giving you a home with real 'wow' factor. 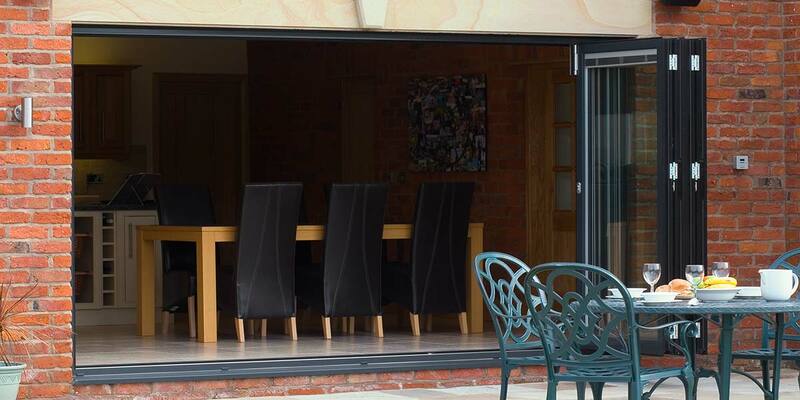 Our aluminium bi-folding doors are incredibly versatile, offering a wide choice of sizes, opening options & they're available in a huge range of colours, including realistic wood effect finishes. A well fitted, made-to-measure set of bi-folding doors can really transform a home, flooding the home with lights & allowing you to enjoy views over your garden all year round. French doors and patio doors are often used for separating off internal spaces and bi-folding doors can do exactly the same. When short on space on the inside, just ask for your new bi-folds to ‘open out’ as this way they will concertina outwards, rather than doing so inwardly and occupying valuable space when opened. 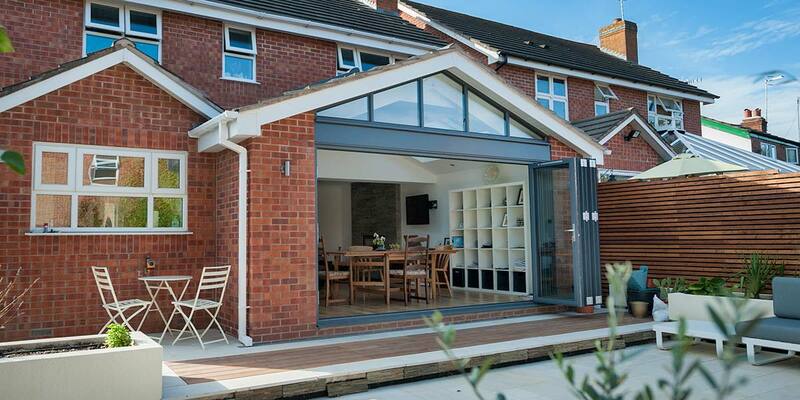 The versatility of a bi-fold does allow for it to ‘open in’ too if you’re blessed with space indoors. 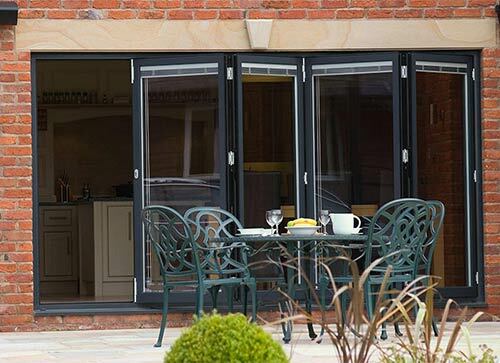 Bi-folding doors work particularly well when put between a living room and kitchen, giving householders the luxury of being able to interchange, though you could have them leading out onto a first floor balcony. 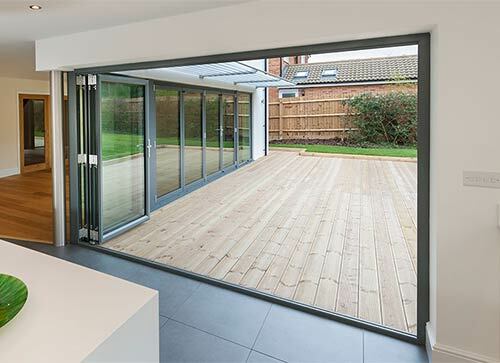 It has become trendy to enjoy open living at home and a bi-folding door installation could be the key ingredient that helps introduce it into your household. 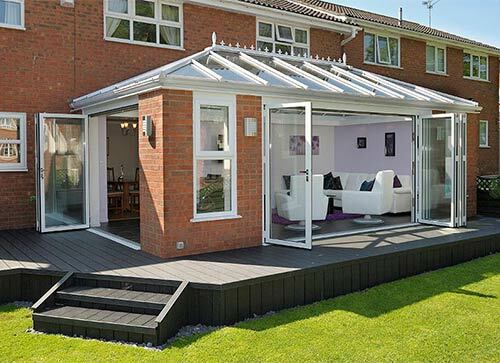 When acting as a barrier between your traditional living area and a conservatory for instance, slide them fully to one side to transform two spaces into one giant living space that offers seemingly endless room. On the occasions when you want to shut yourself off into one of these areas, you only need to push them shut and can do so in seconds. 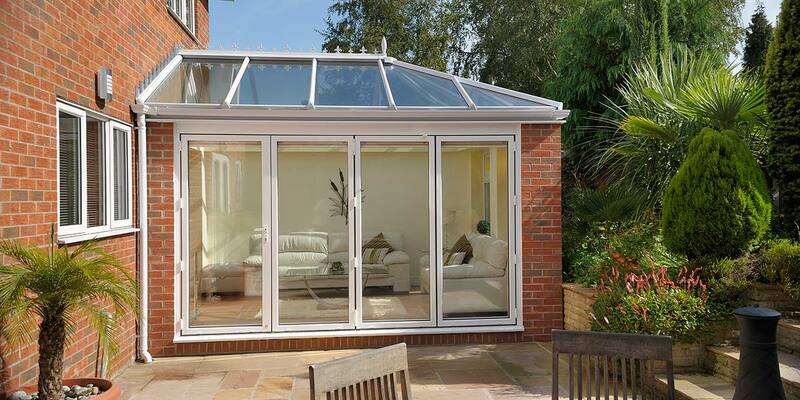 French and patio doors are often included in conservatory designs, as are bi-folding doors, one of the most imaginative door solutions invented. 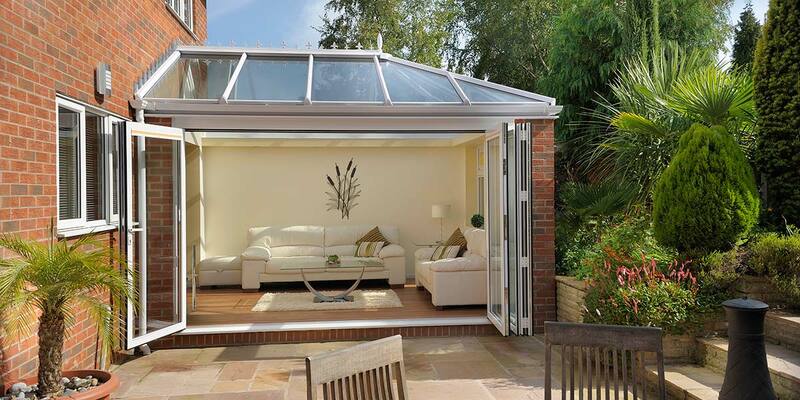 Whether you go for the expansiveness provided by a traditional Victorian or Edwardian conservatory, or your property can only accommodate a compact Lean-To, bi-folding doors can be configured specifically to fit. 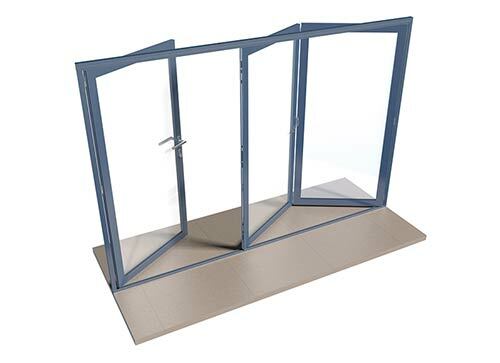 The double opening of a French door may be too limiting for some, whereas a bi-folding door can measure 7 or 8 door leafs long in some circumstances. The effortless way they fold and glide brings a constant smile to the face and makes you want to use them as often as you can. 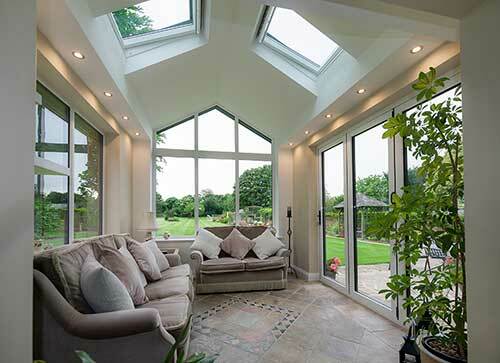 It’s almost as if bi-folding doors were tailor-made for an orangery as they work in perfect contrast to the brick-built columns and external cornice of this most stunning of structures. 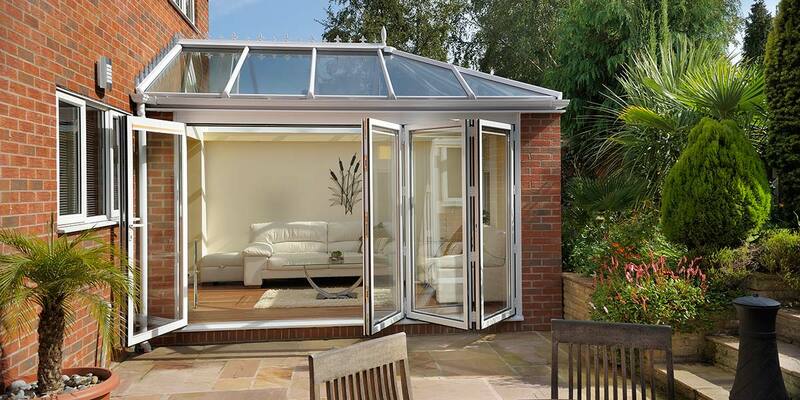 The trademark rectangular shape of an orangery enables anything up to a 7-pane wide bi-folding door to be integrated, giving you an astonishing opening into the garden. Just a slight push of a bi-fold causes the individual door leafs to collectively concertina in the most fashionable way imaginable so that you can exchange living environments at your own leisure. 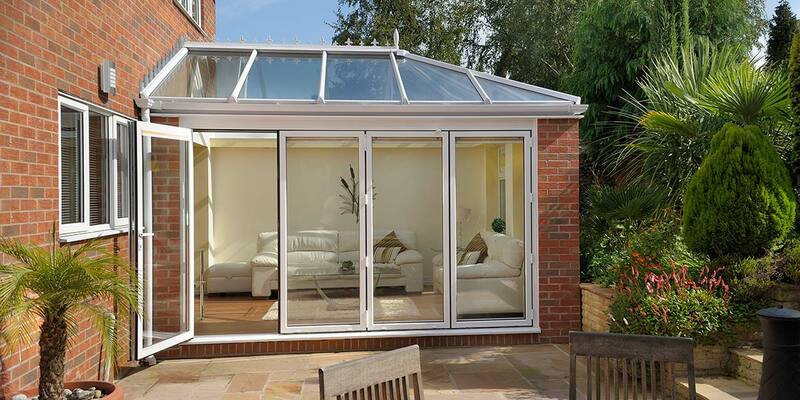 Most bi-folding doors are fitted on the widest facet of an orangery, but there are examples of more than one bi-folding door being incorporated into orangeries if desired. You will immediately recognise the ingenuity of a bi-folding door design the very first time you experience operating one. The way the individual door leafs fold will mesmerise you and have you scratching your head wondering how such a staggeringly clever design could have been developed. What makes them all the more remarkable is that they’re crafted from aluminium, so you would anticipate them being hard to manoeuvre, when the exact opposite is true. 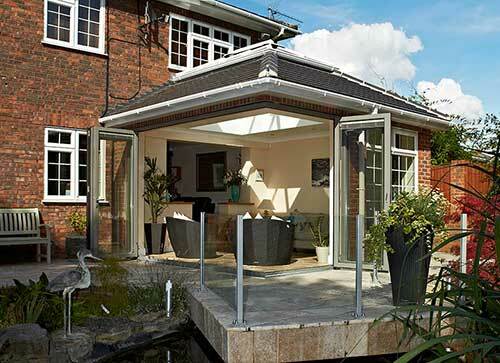 There is undoubtedly no other door solution quite like a set of bi-folding doors. The majestic way they move is unlike anything else and the reason why so many householders are attracted to them. Once installed, you will be desperate to show them off to people as they have real show-stopping attributes. 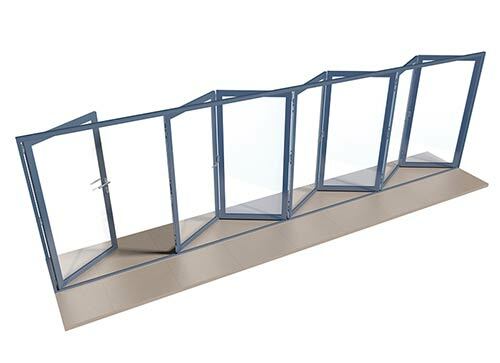 A vital component in a bi-folding door design is the brush present on one end of the running track. This brush keeps the runners free from dirt so that the doors continuously move swiftly from one side to the other with no hindrances. 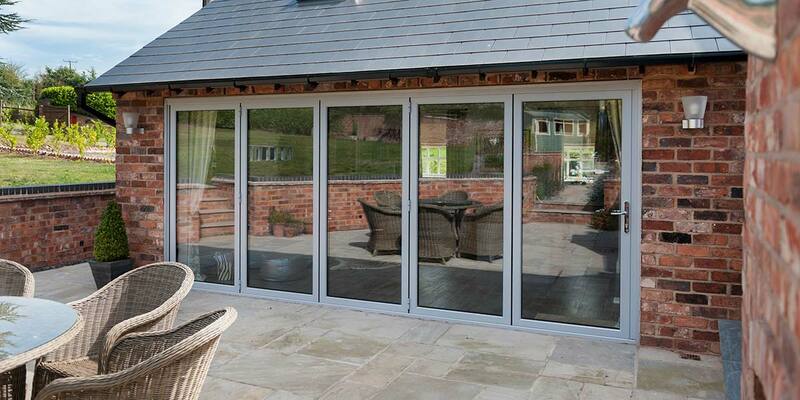 If you decide on a three pane bi-fold door there are two configurations that you can choose from. 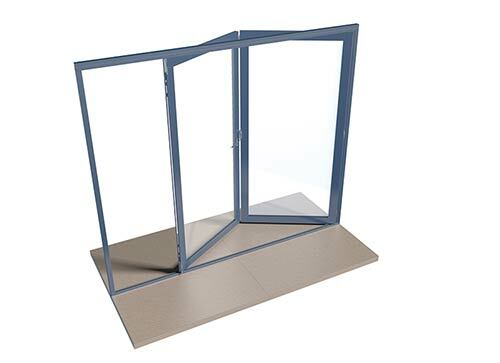 The first configuration is one of the most popular styles of them all; a hinged pass door opens in the same direction as two bi-folding panes to excellent effect. The alternative configuration and the key difference is that the hinge pass door opens in the opposite direction to the two bi-folding panes. 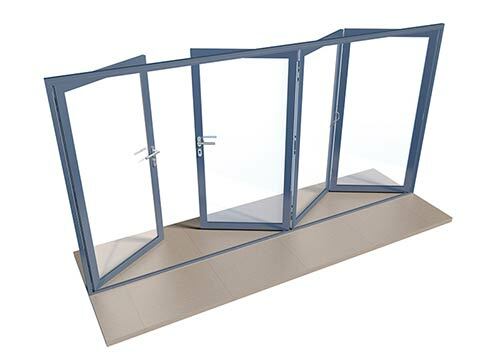 The standard 4 pane comprises of 4 bi-folding panes which all concertina in the same direction, whereas you can choose a door with two sets of two panes folding in the opposite direction to one another. You can also choose a configuration that boasts an integrated French door which means that one of the hinged doors opens in the opposite direction to the other three door panes. 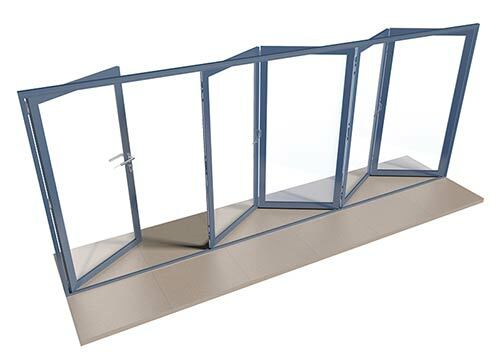 The 6 bi-folding panes, all moving in the same direction, or you can choose an option which features an integrated French door at one end with the main pass door opening in the opposite direction to the other five panes. Perfect symmetry is created by a door configuration with two bi-folding panes either side of a central French door. There are four configurations available. One hinged pass door and six bi-folding sections concertina in one direction, whereas the hinged pass door opens in the opposite direction to the other panes. 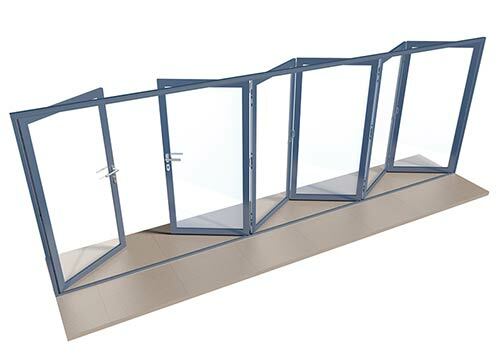 Another configuration has on offset pass door at pane three, adjoined to two bi-folding panes or you can choose a configuration which has an offset pass door at pane three but it is instead connected to four bi-folding panes. At Bon Accord Glass we want every installation to be special and none are more special than our 90° Corner and Bay Sets which are available in almost every configuration to make a stunning addition to your home. 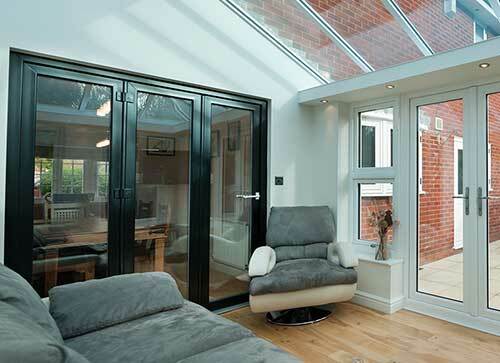 Our corner sets of Bi-fold Doors turn the corner of your room into the bright, light feature. Our doors are available in any colour and almost any combination. You get every advantage of a conventional door set, they are tailored to your size, colour scheme, finish and are available from two to eight leaves, corners can be supplied with or without fixed corner posts to achieve a breath taking uninterrupted view. 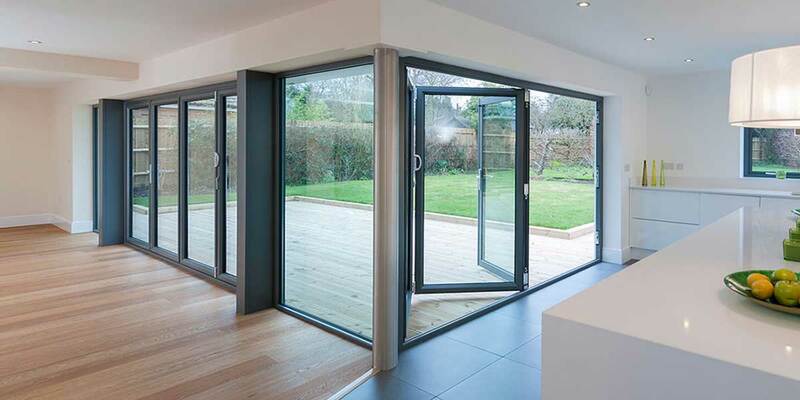 Practical – The length of a bi-folding door will have no bearing on its overall practicality, whether you go for a compact 2-pane design or lengthy 7-pane solution. In both circumstances, you have an infinite number of possible openings. Consider the inclusion of a ‘passenger door’ if you want a bi-fold that opens like a standard hinged door. Effortless – Surely such a domineering door design requires a huge amount of effort to open and close? Quite the opposite actually! These aluminium doors only demand the tiniest of pushes to provide the flexible opening that they’re so synonymous for providing as they virtually feel weightless. 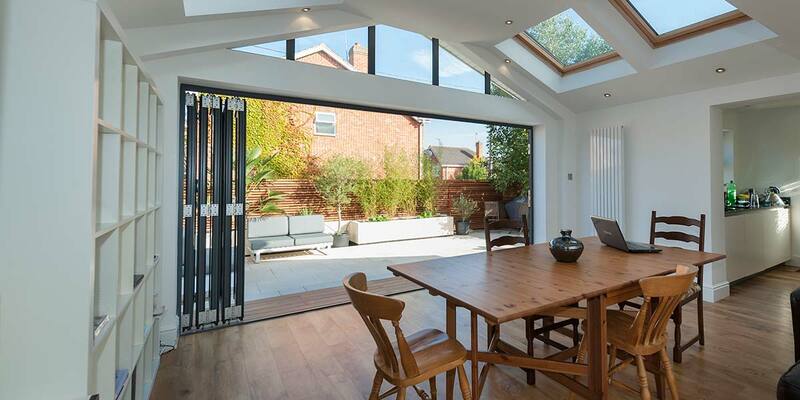 Contemporary – Improvements can always be made to your home and what better way of doing it than integrating bi-folding doors into a property. 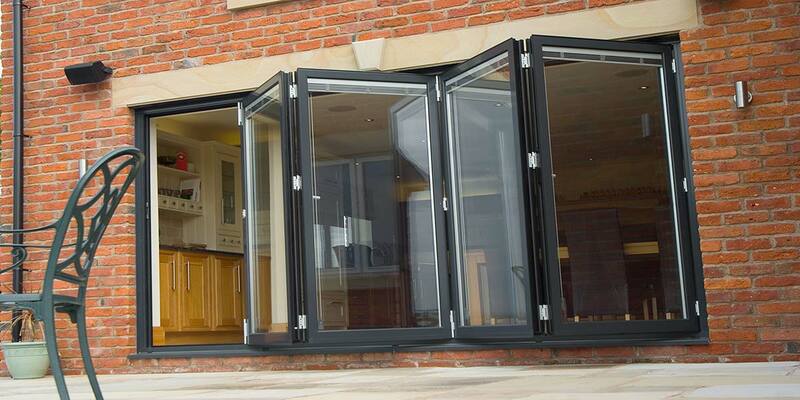 A bi-folding door installation will modernise the house and get it looking more fashionable than ever before. 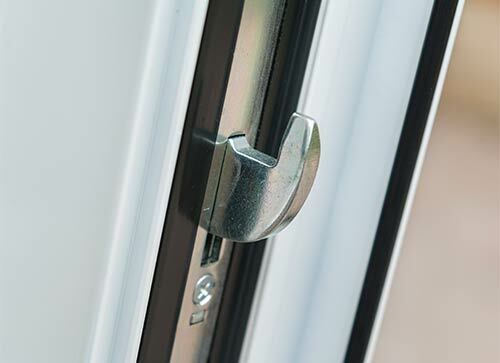 Security is of the utmost importance to householders and we have acknowledged this by integrating a multi-point locking system into our revolutionary bi-folding doors. Shut the lock and it engages at several different points, in several different directions, and into resilient lock keeps to keep the door sash firmly fixed into the door frame. Whether double glazed or triple glazed, the glass also delivers amazing toughness and has been internally beaded so that it’s only possible to remove the glass from the inside of the house. 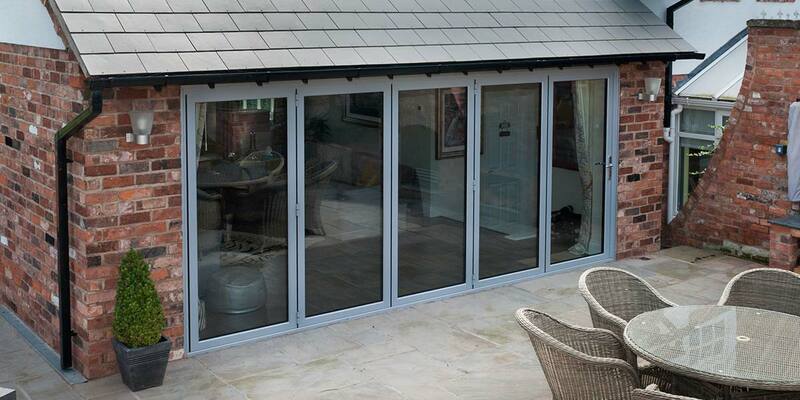 Bi-folding doors cover a large amount of wall space and therefore need to offer the highest standard of insulation so that as little heat as possible is able to escape from your home. You can ask for double glazing or triple glazing to be put into a bi-folding door and the glass used will reflect any heat generated by your boiler back into the house. Stand next to the bi-folds and you will feel the heat. There is a cavity between the two (or three) glazed panes and they’re filled with argon, a dense gas that aids heat transfer. 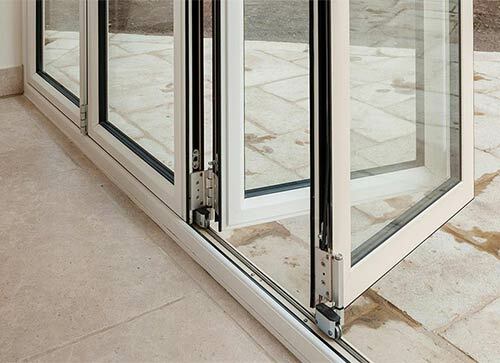 Seals and gaskets within the bi-folding doors also prevent heat leakage at the point where two panes of a bi-folding door meet and the bi-fold is thermally broken to stop the aluminium material from conducting heat. 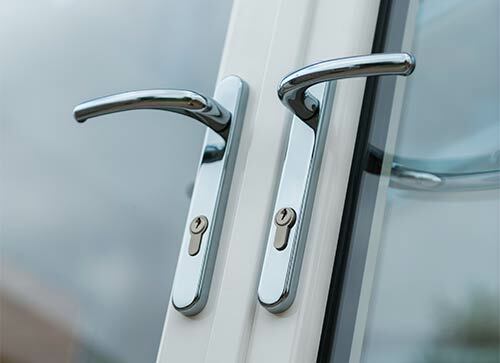 Contemporary Handles – Our contemporary, two-part handles owe their styling to both the brushed steel finish which is the epitome of sophistication, and a separate escutcheon plate which encases the cylinder lock. Three variations of this handle are available, each one intricately and ergonomically different to the next. Suited brushed steel intermediate and D-handles are the automatic choice if you opt for a contemporary master handle. 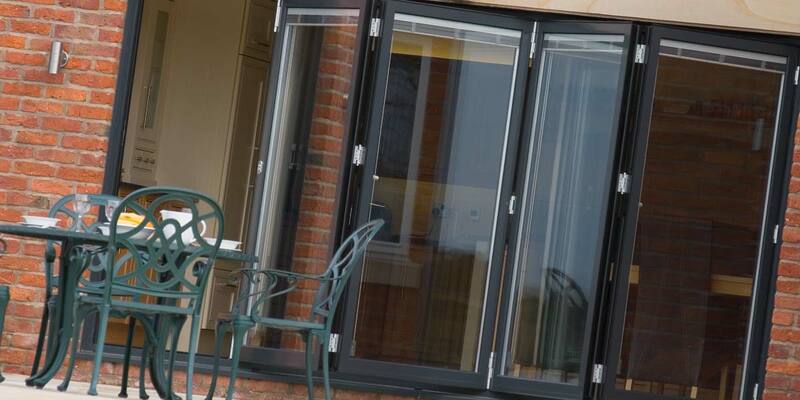 We have a standard colour range for customers buying bi-folding doors, comprised of three timeless shades: gloss white, matt grey and matt black. 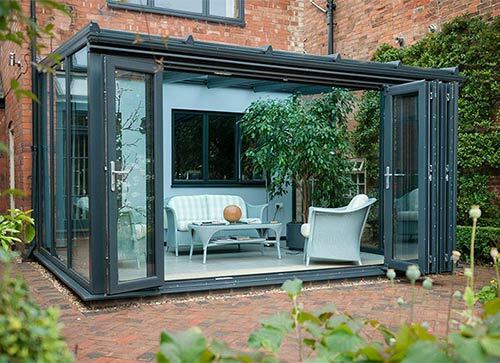 Our matt grey is a particularly popular choice as it really looks the part when applied to the aluminium frames of a bi-folding door and exudes contemporary styling. Other colours are available and pleasingly for customers, they are all completely maintenance-free and deliver lasting appeal. “Your bi-folding doors are crafted from aluminium aren’t they?” We absolutely promise they are, it’s just that we have three sublimated woodgrain finishes up our sleeve that help to make bi-folding doors look as though they’re made from authentic timber. Employing a process called sublimation adds contours and dimensions like you would see in any wood-based product and your options are a Walnut, Rosewood and Oak finish. Wood is certain to never go out of fashion, so picking a woodgrain finish will pay off. You need the outside face of your bi-folding doors to suit the architectural features of your property and the inside of them also need to complement your interior, otherwise there’s a risk that they will look out of place. A sensible way of ensuring both faces work is to pick two colours, one for the outside and one for the inside as we’re more than happy to supply bi-folding doors in a dual coloured finish. The favoured dual finish for most is a ‘grey-on-white’ – matt grey on the outside and gloss white on the inside. We particularly like a woodgrain finish on-white so that the external woodgrain face fits in with the nature outdoors.